Star Awards tickets are priced to sell quickly, purchase yours today! 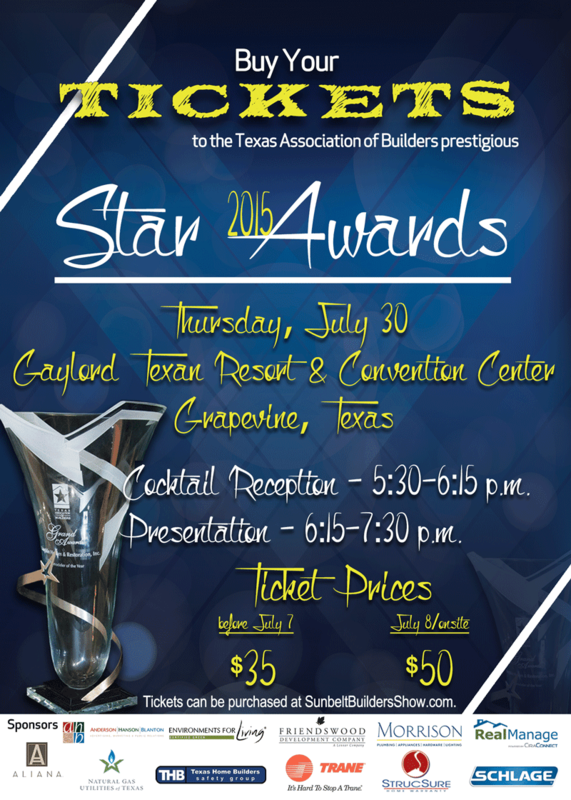 The Texas Association of Builders would like to invite you to attend the 2015 Star Awards held in conjunction with the Sunbelt Builders Show™ on Thursday, July 30 at 5:30 p.m. The cocktail party and presentations will be held inside the prestigious Gaylord Texan® Resort and Convention Center in Grapevine Texas. Seating is limited and tickets are priced to sell quickly ($35 now/$50 after July 7) so don’t procrastinate, buy today. Pay $35 now till July 7 or $50 on July 8 and onsite.